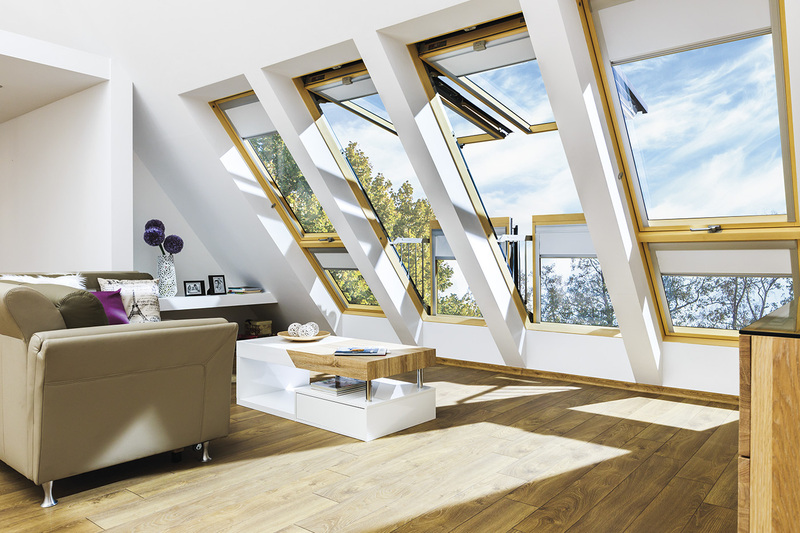 FAKRO, the world’s second largest manufacturer of roof windows strives to ensure the comfort of living within the attic space, and therefore offers the FGH-V Galeria balcony window. Considering the fact that we spend increasingly more time indoors, our instinct tells us to look for contact with nature. We want to enjoy unrestricted views of surrounding areas. For that reason, the innovative balcony window brings us closer to nature as it can easily transform into a functional balcony. The FGH-V Galeria is an innovative roof window whose sashes when opened create a balcony. The upper top hung sash opens upwards, while the lower sash can be tilted forwards to allow easy access to the balcony recess. By opening balcony window you gain an additional space within the attic and close contact with the surrounding areas. Side safety barriers are integrated into the bottom sash and slide out during opening. When closing the lower sash, balcony rails are hidden inside the window and are not visible above the roof surface. Concealed under the window flashing elements they do not collect dirt or spoil aesthetics of the roof. Once the balcony is open, barriers are always dry and clean to secure troublefree operation. The sash when rotated through 0° to 45° is supported by an innovative supporting mechanism which allows leaving the open sash in any position within this range. In pivot mode the upper sash can be rotated through 180° and can locked into position to facilitate safe and easy cleaning of the outer glass. The lower sash is tilted forwards. In order to close it, locks located by the rails of the frame have to be released. The special topSafe system introduced to the Galeria window ensures increased operational safety and burglary resistance. As standard, windows are equipped with tripleglazed, highly energy-efficient and anti-burglary glazing unit with easy maintenance layer. The window is particularly recommended for buildings where special emphasis is put on thermal energy savings. The internal glass is laminated, anti-burglary class P2A. In case of any damage to laminated glass, the glass pieces remain stuck with the film to ensure complete safety. The external glass used in the balcony window is toughened and has a lifetime guarantee against damage by hail stones. Another important element used in the Galeria window is the automatic V40P air inlet that adjusts the air flow channel to provide an optimum amount of air into the room. This also gives a healthy micro-climate, energy savings and reduced heating costs. By opening wide Galeria balcony window you invite the world around to your house. You get plenty of natural light, contact with surrounding areas and stunning views as a gift which definitely help in everyday, active life.